How many times had we been there? 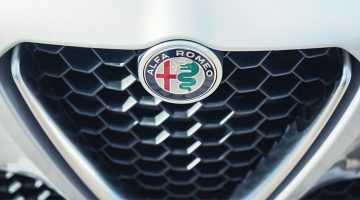 How many times had we listened to the hype, crossed our fingers and dared to believe that, yes, the new Alfa Romeo was going to be the one: the one that signalled the triumphant return of this once glorious brand after decades in the doldrums? Too many times, is the answer. And yet, when Alfa revealed that it was reviving the Giulia name for its new compact saloon, we all felt that familiar feeling of hope rising once again. Then it was revealed that it would be rear-wheel drive, and there would be a 503bhp Quadrifoglio version. This had to be it. Finally Alfa was going to deliver the sort of car that its rich back-catalogue so desperately deserved. For once, we weren’t disappointed. So what’s so good about this Alfa? For starters, just look at it. Compared with the aggressive and steroidal contenders from BMW M and Mercedes-AMG, the subtly enhanced Giulia strikes the perfect balance of style and sporting intent. Look closely and you’ll find plenty of neat details, including the black mesh bonnet vents, the quad exhausts and, of course, the gorgeous enamel cloverleaf badges on the front wings. To make the most of the Giulia’s curves it really needs to be finished in Competizione Red with silver wheels, as pictured here. That’s not an opinion – it’s a fact. The Alfa’s claim to greatness is bolstered when you climb aboard. The driving position is reminiscent of a McLaren’s, as you sit behind a virtually upright wheel (thin-rimmed and exquisitely contoured) while adopting a race car-style straight-legged posture. Then there are the optional carbonfibre-shelled Sparco front seats, which are as good to look at as they are hugely supportive. Glance ahead and you’ll spot the carbonfibre weave in the trailing edge of the bonnet – another indicator that this Alfa is something special. The same lightweight material is also used for the bootlid, roof and propshaft, while the wings and door-skins are aluminium. Philippe Krief, the engineer behind Ferrari’s 458 Speciale, had a hand in the Giulia’s development, and it doesn’t take long before you see and feel his influence. There’s the bright red starter button that sits on the steering wheel and the huge metal gearshift paddles that are linked to a slick and speedy eight-speed automatic gearbox. Then there’s the steering itself, which is extremely quick, with little more than a quarter of a turn needed for most roundabouts and junctions. The ride is supple, too, just like a Ferrari’s in its bumpy road setting. After the stiff-legged gaits of the Alfa’s German rivals, this easy-going nature is welcome on the long drag along the motorway to our photo location. As is the Giulia’s effortless performance, the twin-turbocharged 2.9-litre V6 (Ferrari-based – although neither side likes to talk about it) propelling the Giulia forward with a muscular and lag-free delivery. There’s no sense of inertia – simply squeeze the throttle a few millimetres to pick off slower traffic at will. It’s not the most charismatic-sounding of engines, but on a long, three-lane schlep I’ll take reticent over raucous any day. Leaving the monotony of the motorway and pointing the Alfa’s curvaceous nose towards the countryside reveals another side to its character – one that’s surprisingly easy to access. Switching between the Giulia’s driver modes is a piece of panettone – the seemingly infinite variations of engine, steering, throttle and damper settings of its rivals are nowhere to be seen. Instead there’s the straightforward DNA rotary controller, which gives you a choice between Advanced Efficiency, Natural, Dynamic and Race, each one ramping up the damper stiffness, throttle sharpness and steering weight (you can also manually override the damper settings for a softer ride while in the more aggressive modes). And that’s it. No multiple buttons to press and none of the endless pick ‘n’ mix combinations to choose from. 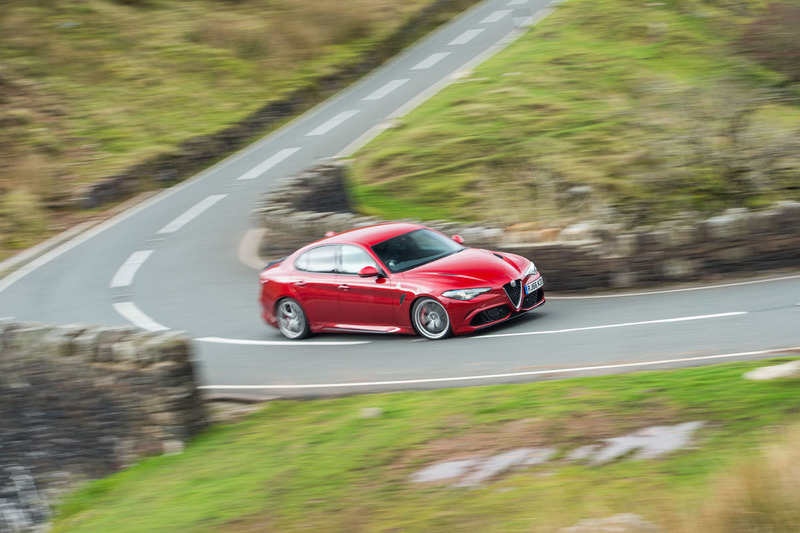 Even in Natural, the Giulia feels alive and connected across these sinuous and undulating roads. The steering is light, but it delivers just enough useful feedback, and once I’ve got used to its electrifying rate of response, I’m soon trusting the messages it sends, all of which are telling me there’s limpet-like front-end grip. 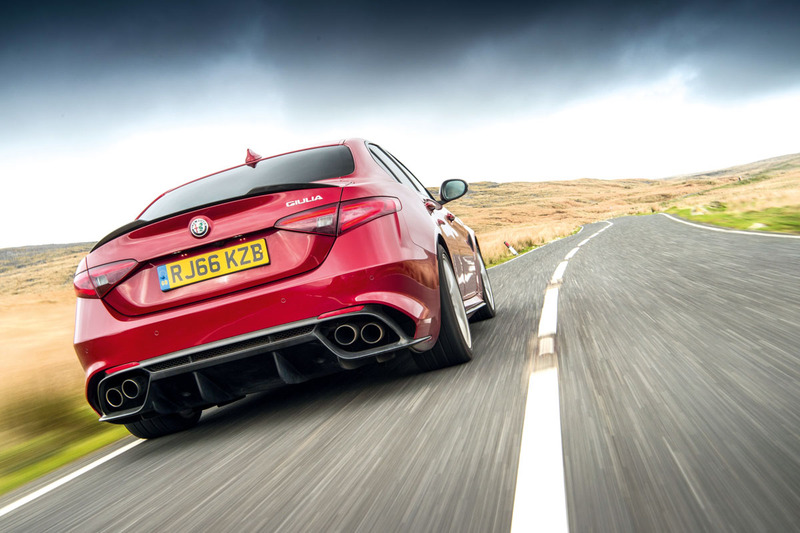 Traction is impressive, too, and the adaptive dampers soak up bumps while keeping body movements well in check, meaning the Alfa glides over these roads with a rare fluidity. Switch to Dynamic and things get a little more serious. 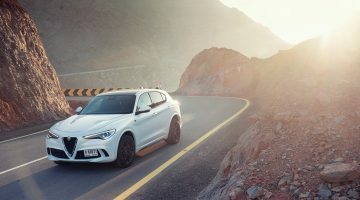 The engine note changes to a deeper timbre, the dampers tense up, there’s greater heft to the wheel, the stability control takes a step back and the throttle becomes more alert. Now the Alfa picks these roads apart with some real intent. It never bullies the tarmac into submission; it simply feels taut, responsive and very, very fast. There’s more freedom to use the combination of quick steering, quick gearshifts and the prodigious poke of the engine to tweak your corner-exit trajectory with the throttle, too. Now twist the DNA knob around to Race and the ESP’s shackles are removed completely and the dampers are at their stiffest – although on these roads it’s just a little too firm, so they need knocking back to ‘mid’. Yet there’s nothing to fear from the electronically unfettered Alfa, because the transition from grip to slip is so progressive, while that wrist-flick rack makes light work of any waywardness. 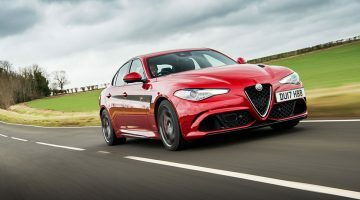 And while the Giulia will play the lairy lout, its electronically controlled differential prefers to drive out of the corners as quickly as possible – sideways is the slow way, as any racer will tell you. The Alfa’s not perfect, mind. That twin-turbo engine serves up blistering pace, but it doesn’t have the soundtrack to match. Its bassy woofle at idle and muted roar when extended add a little drama, but I long for the cry of the company’s iconic Busso V6s. And while the optional carbon-ceramic brakes serve up stupendous stopping power when warmed through, they’re as snatchy as a tired toddler when taking it easy. But these niggles can’t dull our immense affection for the glorious Giulia, the supersaloon that’s shot through with the soul of a supercar. Welcome back, Alfa Romeo – the wait has been agonising, but oh-so worth it.